Our time had come. Due to low altitude cloud cover, the competition organisers called on our team as we had a lower mission altitude profile. After almost two years of development and preparation we were about the carry out the mission to find the lost hiker ‘Outback Joe’, and deliver him a bottle of water. We were escorted out to the airfield, and begun our 15 minute set-up time. This involved: setting up the mast, ground control computers, UAV, pre-flight checks, bottle attachment, and safety briefing. Everything was set-up, however the images which our imaging system should have been automatically taking and uploading were not coming through. We were already a few minutes past our 15-minute set-up time and eating into the 1-hour mission time. Given we had tested this the previous night and it was working, we thought the 3G connection was just taking some time to connect, so we decided to launch and hope that the 3G connection would establish in flight. The BBC had arrived today and were filming us as well. We were cleared for launch. We moved to a location where we could launch the UAV into the wind, and stay clear of the people around the airfield. Mike had the plane in manual control and throttled up, and Geoff threw it into the air. The launch was successful and the plane was held loitering at a height of 100m, ready to commence the mission. Reviewing the information displayed on the Ground Control Station we were happy that our UAV was flying well and were ready to commence the mission. We switched the UAV to Auto mode, and set it to the right waypoint, and it started to make its way towards to search area. The wind was very strong, and we reached the search area very quickly, and started the search pattern so that the imaging system could cover the entire area to find Joe. We noticed that on the down-wind legs of the search pattern our UAV appeared to be flying very erratically, this was confirmed by mission observers at the search area. However the altitude and airspeed seemed to be in control so we decided to continue. 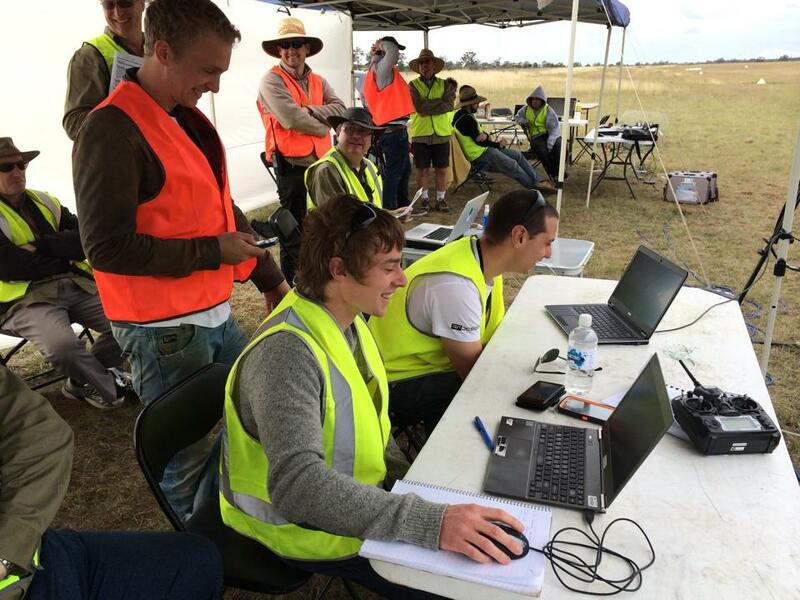 About halfway across the search area, the mission observers advised us that a magpie was swooping our UAV! We were a bit worried and thought we might have to abort the mission, but we were subsequently advised the magpie had left, so we continued. Still no images had come through. This was a problem because without the images we were unable to find Joe. We decided it would be best to carry on in the hopes that the 3G connection would re-establish, and failing that we could bring the UAV back to the airfield home, land, and download the images manually. Our lithium-ion batteries were going very well, we had got through 30 minutes of the flying time, and still have over 60% of the battery capacity left! The mission observers advised that our plane was travelling quite low to the ground. 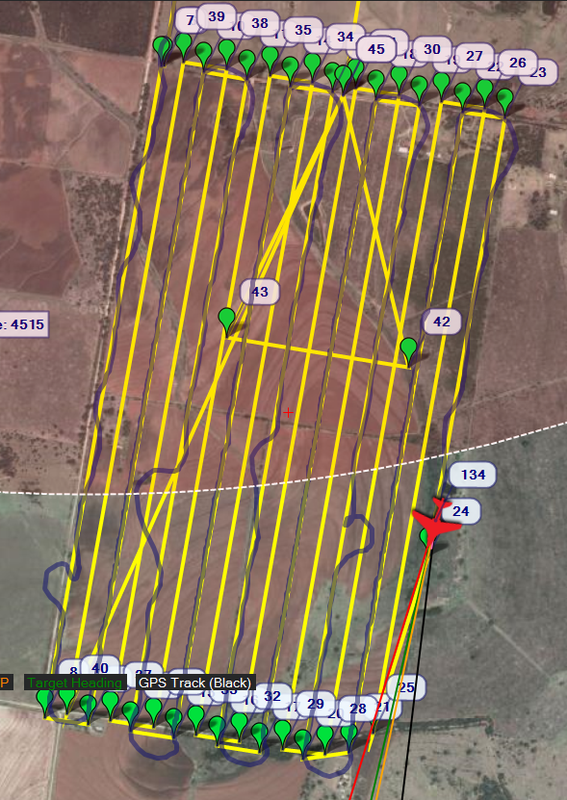 We had made an automatic script that adjusted all the waypoint altitudes so that would compensate for the varying terrain altitude, however looking at the current altitude of the UAV the target altitude did not seem to be set right. We were flying at about 70m above ground level (AGL), instead of the desired 100m, but we were still about the 60m limit so we decided to continue. 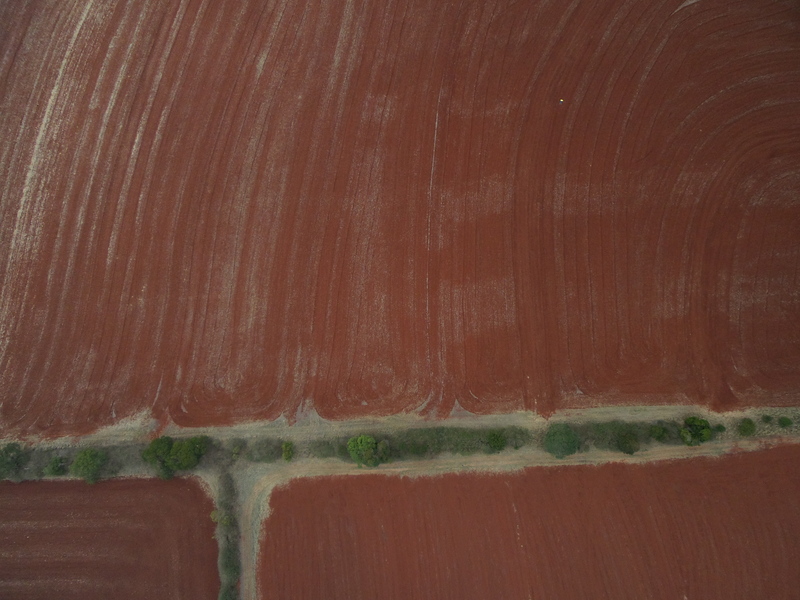 We had made it across the width of the search area, half of the area had been covered and the UAV would then turn around to do the interleaf passes to cover the remaining half of the search area. The wind was picking up and the UAV on the down-wind legs was continuing to behave erratically. On the down-wind turn our ground station reported that the UAV reached a very high bank angle, and then lost comms. We were told that the UAV had crashed. Our mission was over. We had to go and retrieve our UAV, and turn off the transmitters so that the next team could commence their mission. Geoff went off to go and find the UAV and get it back. 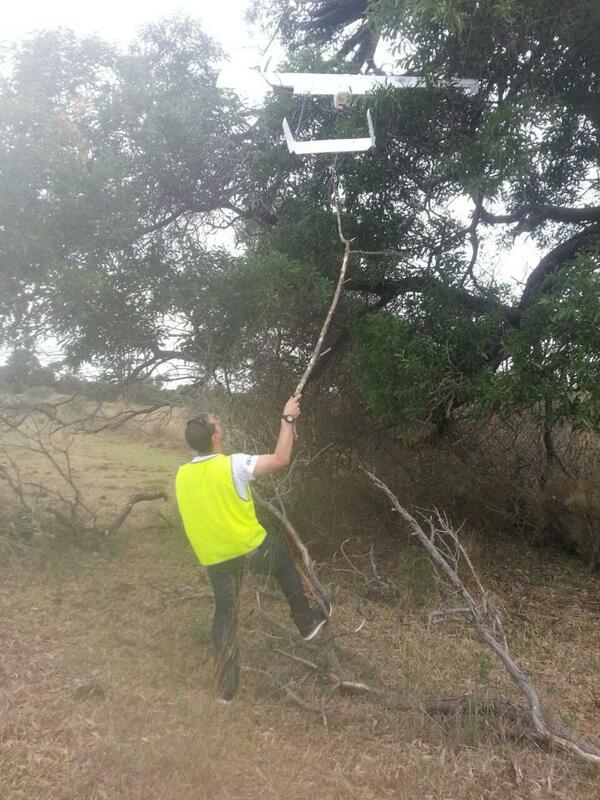 A few minutes later Geoff called and told us that our UAV was in a tree! After a bit of poking with a stick, much to the delight of the BBC film crew, we had a recovered our UAV and made our way back to the main tents. The airframe was quite damaged, but most of the electrics inside appeared to be fine. The inconsistent voltage of the autopilot affected the analogue airspeed sensor. This may have caused our airspeed to be underreporting slightly from the true airspeed by about 15%. This meant that the wind estimation was quite bad, and varied significantly for the upwind and downwind legs. We were using an older version of the ArduPlane autopilot which had the magnetometer (compass sensor) mounted directly on the board. This was getting a large amount of interference from the main power supply, and rendered the sensor effectively useless. During turns the autopilot system relies more heavily of the yaw to determine its attitude, the bad yaw reading meant that the autopilot thought it was pitching up when it was actually level, and thus commanded the plane to pitch down. The plane then lost control and crashed. Thanks to Tridge for his help analysing the log files. Why didn’t the imaging work? We found that the SD card which had the operating system for the imaging system was popped out, and in addition the USB connection for the 3G modem had come disconnected – this was why the imaging system was not working. It was likely that these would have come disconnected when we installed the system in the UAV, and it wasn’t noticed due to the bubble wrap which was protecting the boards. All in all we’re very happy with how far we have come. 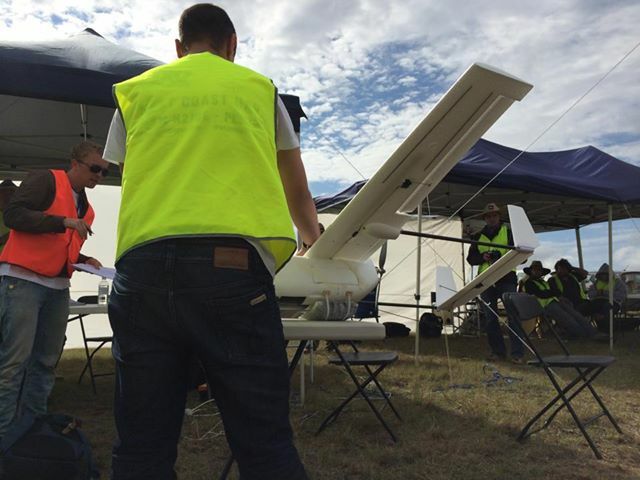 From the 116 teams that entered the competition, only 16 made it through all the Deliverables and were invited to compete at Kingaroy. Out of those 16 teams only 4 successfully completed the mission. We are disappointed that we didn’t complete the mission. It would be easy to say, ‘if only we had fixed the magnetometer’, and ‘if only we had checked the SD card’, but it is actually the experience gained through lots of testing, and the reliability built into the system to ensure these issues don’t occur that really determines the success of the teams in this challenge. We have definitely learnt a lot, and are keen to fix these issues and do a lot more testing, and if the challenge is on again we are keen to give it another go!